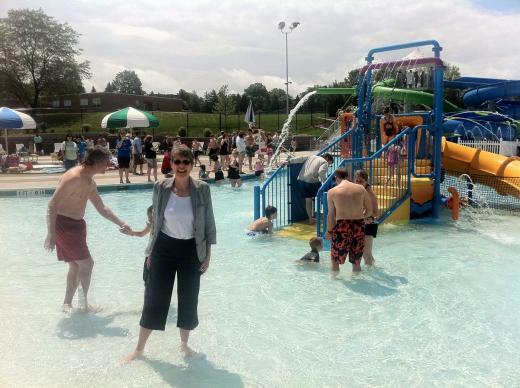 State College Mayor Elizabeth Goreham during Saturday's re-opening ceremony at Welch Pool. Amenities at Welch Pool include this system of slides. 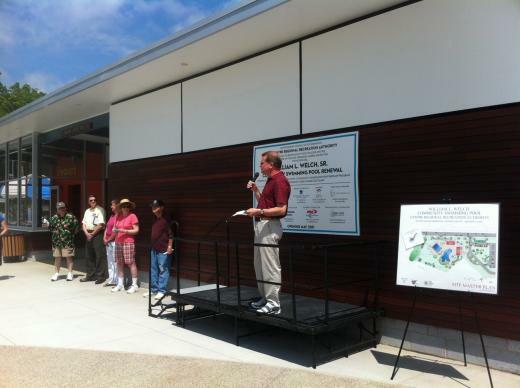 Dan Klees speaks during Saturday's ceremony. 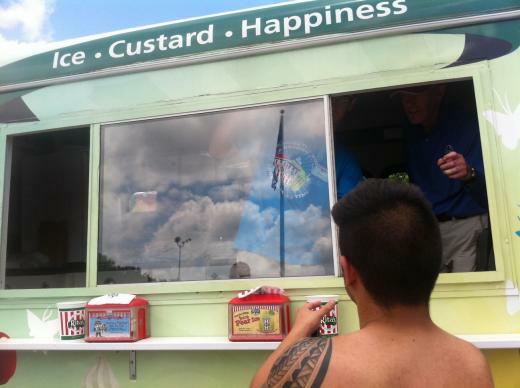 A pool patron enjoys free refreshments. The pool complex is a kid's dream (and it's pretty close to this reporter's ideal swimming facility, too), replete with two slides, a water works area, a lap pool with diving boards and a lazy river. The pool, really more of a water park, was a project 10 years in the making. Ron Woodhead, director of the parks authority, explained that in 2001, plans to renovate the William L. Welch Pool – originally opened in 1959 – began to materialize as the original construction began to show significant deterioration. Moreover, Woodhead explained, people's tastes in pools has changed quite a bit since then. Coalescing the political bodies necessary for making this new pool a reality was no small feat. 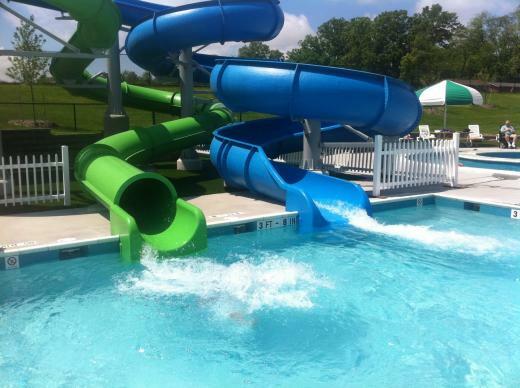 The new pool was achieved through a partnership of five municipalities: the Borough of State College, College Township, Ferguson Township, Harris Township and Patton Township. "There were a lot of compromises that had to be made to make this happen," explained State College Mayor Elizabeth Goreham, who attended the ceremony. She said that because those initial hurdles were able to be cleared, the community has gained a very valuable resource. The reconstruction of the pool was funded through a $7.9 million loan procured jointly by the municipalities, although $2.7 million of that money went to reconstructing the Park Forest Community Swimming Pool adjacent to the Park Forest Elementary School. The work was also partially funded through grants, Woodhead said. The original pool was torn down in December 2009 and remained closed through summer 2010. When asked how the authority planned to measure the success of the project, Woodhead said that, despite the cost and time the reconstruction took, "You can't track the value of having this option available." "It's a safe place to visit," he said. "Healthy and handy, too." When the pool originally opened in 1959, its construction cost about $350,000 – funds that were raised in large part by Dr. William L. Welch, father of the late Mayor Bill Welch. The pool was rededicated to its chief champion in 1968. The sign originally installed at the rededication ceremony has even been incorporated into the design of the new facility. Admission at the pool, which is open from noon to 8 p.m. daily, will cost only $1 through June 4. For more information about rates and hours, check out the Centre Region Parks & Recreation authority website. Editor’s note: Judy Loy is on vacation. Dan Nestlerode submitted a personal finance column in her absence. Judy's column will appear when she returns.